Southern Enterprises MS9223T Media Pedestal Multimedia StorageWhat a mess!! What do you do with all those DVDs when you just don’t have anywhere to put them? You can stack them in corners and stuff them in drawers, but there just never seems to be enough space, and with all the cool movies coming out, your likely to get more! Well, there is a solution, no matter what size house or apartment you have there is a perfect DVD rack for you out there. You’d be surprised just how many DVDs some of those smaller DVD racks and cupboards can hold! Rather than frantically going hunting all over the web, running around looking for garage sales or hitting every store for the perfect furniture piece for your DVD collection, sit back, relax and look over our list. Are your old DVDs strewn about everywhere, but you just can't seem to get rid of them? Sounds like you need a little organizational help on your end. That's okay, we did too. We updated this guide to be more organized, helping you find exactly the right DVD rack for your needs. We bring you small furniture pieces, large racks, wood racks and even those fancy modern stackable types to go onto desks and into entertainment centers. No matter what size, shape or type you are looking for, we are sure to bring you one you will both want and enjoy. On a tight budget? Not a problem! There are great solutions on this list to meet that need as well. The best part about our list is you know that you won’t be wasting your money on low-quality merchandise. Our lists are handpicked for their quality as well as their price. We bring you their best and worst features, and in all honesty, most of the time the worst features are easily overlooked or even fixed easily so that they don’t really take away from the value of the product itself. So, just take a look at what we found, and know that if you need or want more information on how to decide if a product we have is great for you, you will have our Criteria, Additional Information, and FAQs to help with it. Still, want more? Feel free to check our sources at the bottom as well- after all, we feel you should be able to have all you need right at your fingertips. 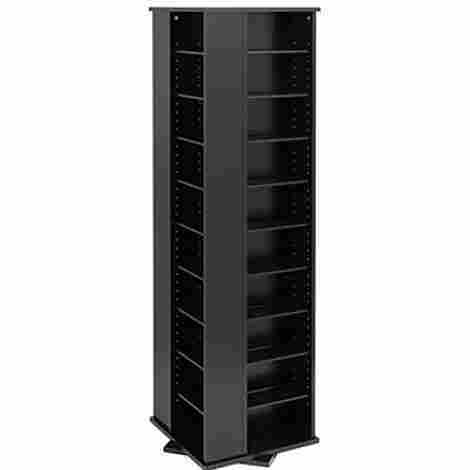 Need something that can fit over 500 DVDs but doesn’t take up more than a corner of your room? Prepac has the solution in their Large Four-sided Spinning Media Cabinet! Never have to go surfing to find your DVDs again. 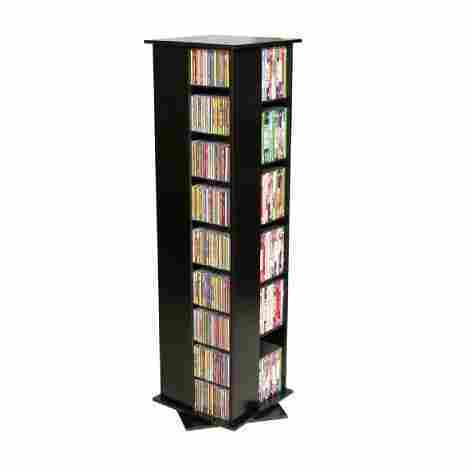 This beauty can hold over 500 DVDs and you don’t have to stack them to accomplish the job! Once you slide them into the shelves, you can easily locate them without having to dig. Not many units offer you this much DVD room for such a small amount of space. Don’t just settle for something that can hold so many, get the ease of retrieval as well. You can put everything into this unit and simply rotate it like you would when shopping for them at electronic stores. No more hassle of sliding DVDs out just to see what is under or behind the one you’re looking at, simply fill the shelves and rotate the unit to find the one you want. While a bit in the expensive range for most, this product is a high-quality make. Better than most units used even in local stores, this hardy piece of furniture finds its value in being long-lasting, taking up little space and offering ease of use. Even the shelves can be adjusted if you are looking to use it for other media such as CDs or books. Truly a great find! Like a more wood feel to your DVD rack, but still need to save space? Atlantic Summit Media Center may have the solution in its beautifully designed space saver build, and it won’t break your wallet! This wonderfully made build comes with adjustable shelves allowing you to set the height to fit any size DVD case on it. We know some DVDs are collectables and don’t fit your standard sized shelf space, that’s why being able to adjust the height and placement of shelves is important for any true DVD collector. Some DIY shelves are difficult to put together even with instructions. This unit not only comes with directions that are easy to follow, but all the parts are organized and labeled, so you don’t have to question if that hole is for the small screw, or if you missed something. Know which piece goes where from start to finish! You deserve quality that doesn’t have to break your bank account to get. Atlantic Summit Media Cabinet offers you an easy to build, durable cabinet that fits easily into any corner of your living room. With it’s ability to adjust to your needs and the fact that it can fit over 100 DVDs the value of this piece makes its price tag even more amazing. Want something efficient, stylish and able to hold up over time? Walker Edisons 41” Media Cabinet may be the answer for you. Having a great looking cabinet doesn’t mean you have to give up space or child safety possibilities! If you are looking for a small cabinet that fits all your DVDs safely, and in a small space, Walker Edison 41" Media Cabinet is perfect for you. With its gorgeous safety glass doors, you can be sure that once you’re done cleaning, your DVDs stay right where they are supposed to. Expecting company or have children? Then having doors on your cabinet can give you a peace of mind as well. Want to have that ‘wow’ reaction, but don’t have a lot of space or money to spend? The Walker Edison 41" Media Cabinet saves you on both while providing you with an elegant black finishing look as well. Wow your friends and family by having a great looking piece and not having to spend like a millionaire to get it! While looks can be deceiving, with the Walker Edison Media Cabinet isn’t sacrificing anything while still bringing you affordable and quality shelving. 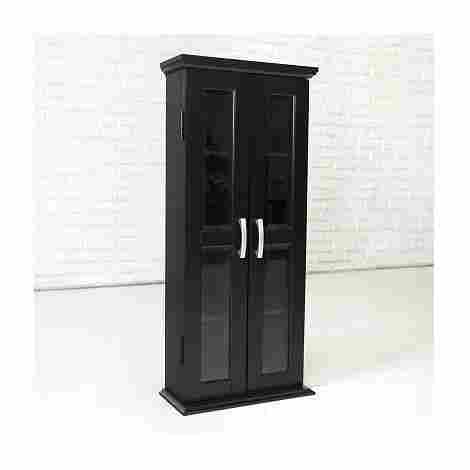 This little piece is sturdy and shows its value with the sleek black finish and doors that easily close and stay closed. The best part? Compared to most, this cabinet has all of that and not the cost! Definitely a great find. Another space-saving option with a gorgeous appearance and important features for those looking to keep their collection safe and put away. The Winsome Wood CD/DVD Cabinet offers a great look for any decorative owner looking for a nice place to keep their DVD collection. Want to impress you’re your guests with a piece that fits in with other antique furnishings but don’t have a lot of space to do so? 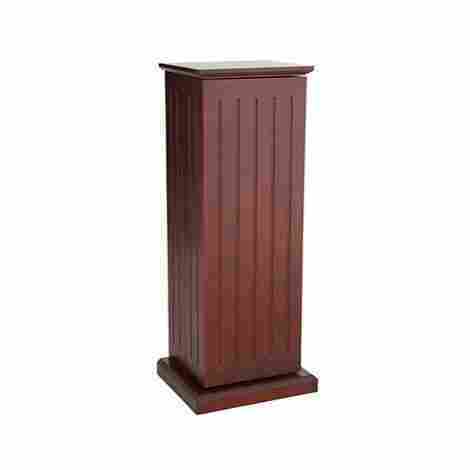 The Winsome Wood CD/DVD Cabinet is a great addition to any home with its walnut finish and antique looking design. This piece doesn’t just look like wood, it is wood! Sturdy wood pieces mean this beautiful cabinet may actually join any other family heirlooms passed through the generations and eventually earn that long-desired title of ‘antique’! When you don’t want to settle for just another cabinet built of particle board or pressed wood, go for this easily assembled, working cabinet. Well worth every penny, the value of this cabinet is in its design. 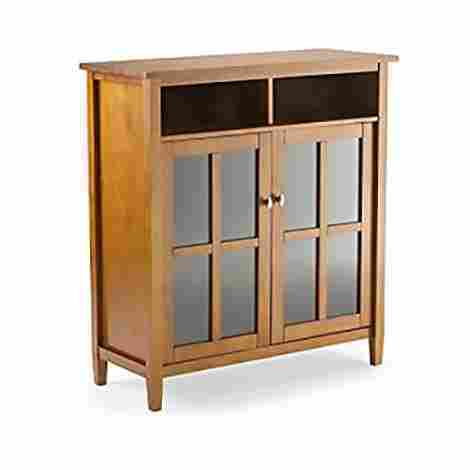 Not satisfied with providing generic pieces with a polished appearance this media storage unit is real polished wood and it has the safety of closing doors as well as the look of other truly antique shelving. 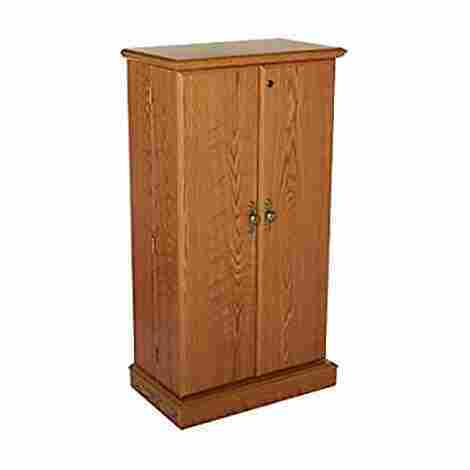 Made to last, the Winsome Wood CD/DVD Cabinet is a great value and addition to any home. Don’t even have the room to add another shelf, but still need a place for your DVDs? There is a solution that is both modern and gorgeous in design that can fit on the already present surfaces of your home- and it’s stackable too! It’s nice to know you have a place for your DVDs that looks good and can be as small or as large as you need without looking awful or needing its own personal little section of space in what might be an already packed house or apartment. Stori also makes CD sized stackable shelving that works with the DVD shelves! Now you can tackle two of your collections at once! You might look at the picture and think what your getting is a cheap plastic box, but it isn’t- and you will know the difference right away when you get it. Made with acrylic, these stackable shelves are modern and pretty as well as durable. Enjoy the clean look and ease of use and don’t worry about any heavy assembling with these gorgeous stackable shelves. Compared to the rest of the products on our list, this is the easiest on your pocket for the quick buy. If you don’t have too large of a collection, it’s also the perfect choice for you. The value lies in having the ability to continually expand as needed while not having to spend a lot and not needing a lot of space to set up. Looking for something handmade to add to your furniture that looks good and durable? Look no further than the Simpli Home Warm Shaker Media Cabinet! This pretty piece takes a little more room width wise but is short enough to offer more space to set things down or stack onto. This is a beautifully crafted cabinet made of high-quality pine wood. Many people will stand by the quality of such items in the home as they are well known to last years longer than most factory-created pieces. Knowing that someone took the time to craft your furniture piece carefully means you can rest easy in knowing that your cabinet will likely outlast even the most modern pieces other people have and not need to be replaced. It can be a daunting task to try and assemble any piece of furniture, but when you know it was hand-made to start with you may worry even more at the complexity. Worry not! The Simpli Home Warm Shaker Media Cabinet is easily assembled, has labeled pieces and even comes with extra parts just in case! Like most handmade items though, you may actually find you’ve lost the extra’s a long, long time before you needed them- if you ever need them! Though one of the most expensive pieces on our list, the Simpli Home Warm Shaker Media Cabinet is also one of the best value and highest quality one can find. Making it easy to assemble, durable and using the best materials, what you really need to consider is if the cheaper cabinets out there will last just as long, or need constant replacing, while the Simpli Home Warm Shaker Media Cabinet is still doing exactly what you bought it for. Years of use without needing to replace an item raises its value in anyone's mind to far exceed its cost! Don’t just want to put your collection away, but also want the clean appearance when you’re done? Some people find even the look of viewable shelves to be claustrophobically cluttered feeling. If you are someone who prefers that your collection stay completely out of view when they are put away, and need it all to fit in a smaller space despite the size of your collection, the Sauder 401349 may be exactly what you are looking for. The beautiful design of this piece lets you keep your collection safely out of view of searching eyes, and leaves your house feeling more spacious. With the solid doors, you can simply close up your collection when it’s not in use and focus on what you want. No more distracting clutter feeling when things are put away! What’s even better? The shelves line both the back of the cabinet and the doors! Plenty of room to get it all put away! Want to feel even safer? Not only does the Sauder 401349 keep your collection out of view, but it has a key lock as well! So if you're concerned about your neighborhood, or simply don’t want young and prying eyes to go over your entire collection, this is the perfect solution for you! Not the most expensive when compared to others on our list, but definitely one with a lot of value. Offering peace of mind that your collection is only available when you want it to be, and the feeling of a truly clean and spacious amount of room, the Sauder 401349 offers features that most don’t. 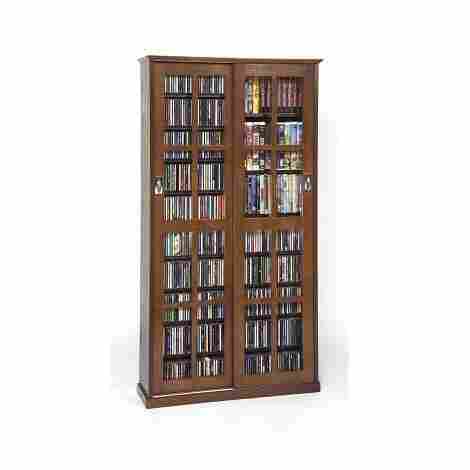 With the capacity to hold over 200 DVDs it also offers you the ability to hold a good-sized collection without needing to get and find space for multiple shelving units, which could end up costing more than just this one piece of quality furniture. Want something that looks nice, offers great storage capacity and will last? The Venture Horizon Revolving Media Tower not only gives you storage for a large collection of DVDs but is built by a company set on quality. Offering you the same ease of DVD surfing as you get with any revolving unit, this beautifully crafted and durable design also gives you plenty of space, holding over 500 DVDs in a small corner of the room without having to double stack anything. The fact it also revolves means you can sit it right next to your couch or entertainment center and look for the right movie with ease. Made of high quality and durable material this little shelf is built to last. Not only is the shelving itself made to last, but the swivel is made of super strong fiber glass material which can handle up to 400 pounds and still move easily! With it being available in black, cherry, oak or walnut, you’re sure to find one that fits right in with the rest of your decor. Don’t run away at the price of this one, it proves it’s worth on repeated fronts. With ease of use, assembly and a one-year manufacturer’s warranty, even if you do find an issue the company will help you fix it for up to one year! This beautiful cabinet promises to be one of the best buys you can make, and outlast most competition as well as holding up to the quality and ease of use, making worth of every single penny. It may be well worth saving back just so you can enjoy the quality and luxury of this DVD rack in your own home. If space isn’t your concern, but design and appearance are, then the LDE Leslie Dame MS-700W may be what you want. 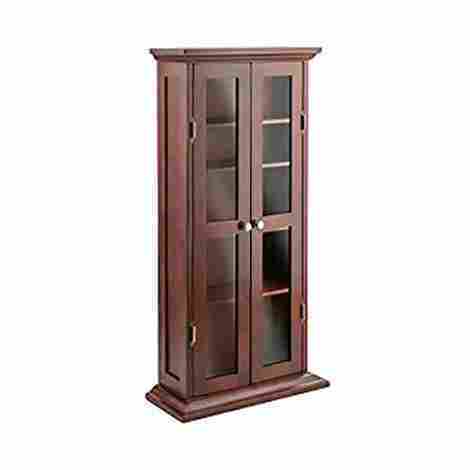 This beautiful wood media shelving unit has many possibilities and can hold a lot of DVDs. Its gorgeous aesthetic draw will add a sense of glamour to any home. One of the most important things when purchasing furniture that needs assembling is knowing you can contact and get good help from the company who put the pieces together. If that is what you are seeking first the Leslie Dame MS-700w is the shelf or at least the company, you are looking for. Known for quick and quality customer service, you won’t find yourself wondering if what went wrong was because of something you did, or if there really are missing parts to your choice shelves. On top of that, they are willing to help replace or even refund you for any faulty items. Not only is this one of the prettiest pieces you can choose from this list, but also one of the easiest to assemble. Just because a unit looks complicated, doesn’t mean it has to be. Leslie Dame understands this, and understands the desire to keep your house looking as pretty as it is inviting for any guests you may choose to show your newly built shelving off too, leaving you looking and feeling good! This is an expensive unit, but for the appeal and quality, the price may be worth it. Not only do you get all the satisfaction as you would from many of the other pieces in knowing it won’t take you all day to set it up, but you know that you won’t be alone in the process of making sure everything is just right. Customer service is a value that the dollar often can’t replace. When you pay more you get more a lot of the time, and this is no exception. Want a unique feel to your DVD storage? Prefer to stand out from the standard? The SEI Cherry Media-storage is a perfectly built DVD rack/shelving unit for you! A little on the eccentric side, this piece gives something of a cross between a gothic and Victorian feel to its appearance. If unique is what you want, look no further! Unlike the other wood pieces on this list that require you to put in the extra mile to have your dream shelf, the SEI Cherry Media-storage doesn’t and that is what makes this shelving unit stand out The fact it comes pre-assembled may make your decision easy. If you can’t handle another task on your plate, whether because of health or just that you already have a lot to do in your busy schedule, then allow the SEI Cherry Media-storage to be the answer for you. The SEI Cherry Media-storage offers storage both in the door and the main unit, which often comes with the downside of a piece of furniture being easy to tip over, especially on carpet. This little unit, however, has a sturdy square base which adds more support and helps to keep it safe from tipping over. 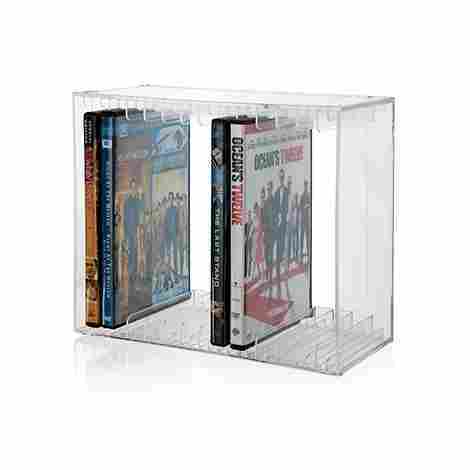 While not the most expensive on our list, this little DVD rack/stand can still seem a bit steep in cost. When your priorities are in the durability, design, ease of use and amount of use you can put to the little shelving unit, however, the value comes shining through. Built to last and give you plenty of space to store your collection, the value of this shelving unit far outweighs its cost. We hope you found our list comprehensive and full of choices you can appreciate. Quite possibly the list has not only given you some great ideas but has helped you to find the shelving rack you intend to purchase for your home. We try to find Quality items for all walks of life and bring them straight to you from the comfort of your seat, this way you can return to other parts of your life quickly and with the assurance that the item you chose will be high in quality and last you longer. If the information you were hoping for wasn’t available here, feel free to look over the Criteria sections for better descriptions of what we used to choose these shelves, the Additional information for some safety guidelines and other information, and our FAQ for answers to commonly asked questions. If your answers aren’t there, also take a look at our resources and feel free to search for the answers in the same sites we used to find our own answers. Assembly of a product you ordered can be one of the biggest hassles. In order to make sure the products we chose are true of worth and won’t break you down into pieces we tried to assure that the assembly of every unit was easily handled. You may wonder then why some of these have cons that contradict ease of assembly. In most cases, these were packaging errors and very rare to take place, but we want you to remain aware of the possibility in case the product you get has the same issue. In other cases, you can find easier to follow instructions online either by looking the product up on google, contacting the company, or by visiting Youtube for a follow along video. No matter what the case, most of the customers were satisfied and found the problems easy to handle and were still done with the build process in less than two hours. That being said, we want to assure you that if done properly these builds are simple and may not require a lot of help. If you do have health concerns over weightier objects, you may still want to get yourself a helper to make sure your build goes quickly and safely to give you the outcome you desired. You don’t want to purchase something that is going to break in the first few days of use, and with DVDs you need it to be able to handle a large amount of weight. Due to their intended use, if the materials aren’t durable they can crack and fall apart, and or cause dangerous breaks- especially if the shelving unit has glass in the doors. We put a lot of time and research into making sure that the materials used are also capable of what the design intends for them. Sometimes what looks nice is made of low-quality materials that simply can’t or don’t stand up to the pressure of long-term use, even if they seem like they will at first. In order to make sure you get what you need we made sure that if we didn’t know exactly what a material was, or didn’t understand the difference between it and another material. If we felt that the material truly was up to the task, we would then double check ourselves to see if one of our other items was made of something even better, and then compare and contrast the designs. In this way, we were assured you would get the best design in combination with the long-lasting materials needed for your shelf. With proper care your DVD rack should last you years and not break or give out, meaning every dollar you spent was spent well, and if for some reason it doesn’t, we know that you will be able to find the help and services you need to either fix or replace the items easily. More often than not, the reason we need shelves is that there isn’t enough space for something as it is. That being said, we tried to make sure that no matter what size your home is the item will fit where you need it. A lot of times we will come across something that looks great and sounds great, but once we get the item we have nowhere to put it, which only adds to the lack of room for which the item was purchased to try and help with. We also want to help you make sure that, even with our choices, you don’t end up with the same issues. In order to help you with further making sure your new piece of furniture will fit, we suggest checking the provided dimensions and measuring exactly where you want to put it. It is always advisable not to have two pieces of furniture flush to each other, in case something shifts a major accident does not occur. As always, we, at Gearhunt, have to make sure that when we provide you a list, the cost and value are at the very least on equal grounds. This is a key factor when looking especially at pricier objects because if you’re spending a lot of money, you do not want to have to pay even more in a short time to replace what you already bought. Likewise, if something is cheaper in cost, we want to make sure that the item is up to standards because if it isn’t you could end up spending more in the log term than if you simply purchased a similar item at a slightly higher cost. Value is derived from how durable an item is, or in other words how much it can take without breaking, how long the item lasts when properly used, how effective an item is and if the item meets the needs of the person making the purchase. One such value comes from customer service which can be supplied through warranty, communication and or willingness to provide a customer with valuable information in the proper use and care for the item. Even something as simple as providing extra materials or a list of what can be used to replace any of the pieces adds to that quality. Whenever you purchase a piece of furniture there are several things you should consider beyond its physical appeal. Two of the most important considerations are time and space. Most online purchases and even in-store purchases require you to assemble the furniture at home. Very little comes pre-assembled in today’s era. That being said, here are some key things to look at. Do you have the space to work? Even if the finished object will fit in the areas you want it in, when it isn’t put together it can take up to two or three times the amount of space to assemble it. You should make sure you have a place cleared where you can keep all pieces in view while assembling, and keep tools safely within reach without risking harm to yourself or the stray visitor who may wander in to see what you are up to. If you don’t think you have the space to work on it and cannot make the space available safely, you may wish to consider a smaller item than you originally intended. Time is just as important. We try to supply you a list of top tens that are easy and quick to assemble (less than two hours) but once you get started, even two hours can seem an eternity. If you aren’t sure the space you have made for assembling the item will give you the time needed apart from children, friends and other would-be viewers who aren’t planning to help out (or may even cause a safety hazard while you work). Q: How do I know if I have enough room to build my DVD rack/shelf? A: Check the dimensions usually provided on the site the product is on, and measure out the width and length of your biggest expected pieces. Double the width and add about an inch to an inch and a half to either side to give yourself some wiggle room. Make sure you have a place to set your tools and the smaller pieces where they will always be in sight and within easy reach. When you go to put the shelves together, give the instructions a good once over before starting to see what comes in order, and plan on only taking out what is needed as it is needed. 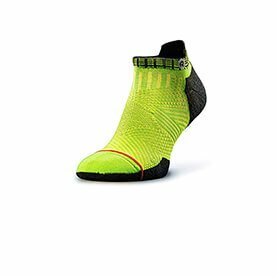 This will allow you to know you have plenty of room to work in without stepping on your own toes. We have also supplied our source information in helping to plan your purchase and how best to prepare to build. Q: How can I tell if I have all the parts I’m supposed to? A: Usually a parts list is part of the owner’s manual or the instructions that are provided with the object in its packaging. This is why giving a once-over is a great planning technique. If you are missing something, it is best to contact the company ASAP and let them know right away so they can help you replace the missing item. Q: Where can I find information on measuring a fit, and setting up, for a new piece? A: As always we want to provide you with everything we can to help you decide what is right for you, whether you find it in our top ten, or elsewhere. You as our reader are important to us, and so we source our information and even provide extra links at points so you can find everything you need easily. If you need specific information on how to measure or think there may be a better way to set up for a build, feel free to check the links below and see if you might find something to fit your needs.